Broide and Co. is a Jerusalem-based CPA firm, providing accounting, auditing, taxation, management and business consulting services. Our professional team provides high-quality, efficient services to clients in Jerusalem, the Greater Tel-Aviv area and abroad. The firm is characterised by its unique combination of professionalism with close and personal involvement in clients' business and financial matters. Our competent staff have substantial international experience, and work closely with clients' lawyers, bankers, financial and other advisors. We develop and maintain very close personal relations with our clients, working essentially as part of their team. We call ourselves the "Broide Team". All matters handled by the firm are treated with strict confidentiality, and in accordance with the highest ethical standards, as stipulated in the accounting profession's Code of Ethical Behaviour. We really are geared for servicing the “Anglos” in Israel and abroad. We focus on our clients’ (and their families’) needs, providing professional and efficient guidance in growing their businesses and minimizing taxes. Our experience in assisting foreign businesses and their professional advisors in their Israeli activities, including our renowned “hand-holding” is valued by our clients. Our “team” is proficient in English and Hebrew, and places maximum emphasis on service. I’m always available and glad to have a personal chat. 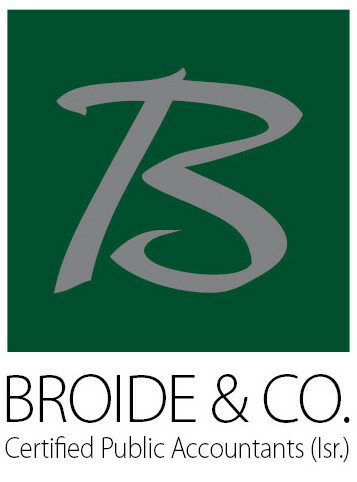 Broide & Co, is an independent member firm of PrimeGlobal, a worldwide association of independent accounting firms and and business advisors, providing a wide range of tools and resources to help furnish superior accounting, auditing, and management services to clients around the globe.